Cooked egg noodles dressed in rapeseed oil. 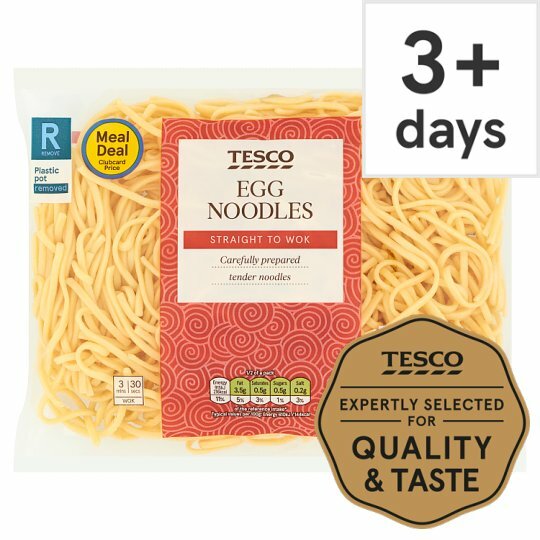 Tesco Egg Noodles. Carefully prepared tender noodles. INGREDIENTS: Water, Wheat Flour [Wheat Flour, Calcium Carbonate, Iron, Niacin, Thiamin], Rapeseed Oil, Pasteurised Egg, Salt, Firming Agent (Potassium Carbonate, Sodium Carbonate), Acidity Regulator (Citric Acid), Colour (Beta-Carotene). Place on a non-metallic plate and cook on full power.